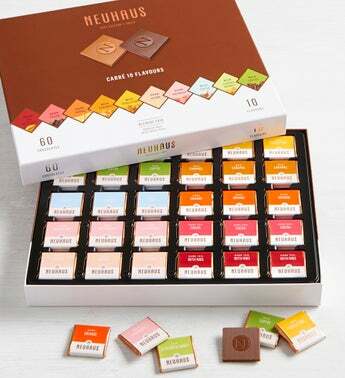 Neuhaus Carré 10 flavors assortment box will appeal to any chocolate lover. Sixty individually wrapped imported Belgian chocolate squares presented in a handsome box. Lovers of dark chocolate will discover traditional chocolate, intensely dark chocolate with nibs (70% cocoa mass), dark chocolate with sesame flavor, orange, and raspberry or plain dark chocolate. Those who are looking for a milk chocolate taste experience will be pleased to find milk chocolate with caramel, feuilletine, almonds & honey, coffee or pure milk chocolate. Ttl Nt Wt. 10.58 oz. Gift Measures 9.75" x 8" x 1.25"
Neuhaus Carré assortment box will appeal to any chocolate lover. Sixty individually wrapped imported Belgian chocolate squares presented in a handsome box. Ten delicious flavors including 70% dark chocolate, dark chocolate sesame, orange, and raspberry as well as milk chocolate with caramel, feuilletine, almonds & honey, coffee and more.